Abstract: Political terrorism has long been a key feature of Middle Eastern politics given the high degree of conflict, relative ineffectiveness of direct military means, ideological rationalizations, and willingness of states to sponsor such activities. The aftermath of the September 11, 2001, attacks on the United States and the subsequent American war against terrorism have focused attention on the financing of such movements and operations. The lines of political influence follow those of economic assistance. This article analyzes the state of knowledge regarding this issue. The al-Qa'ida suicide hijackings underscored the post-blast, investigative utility of tracking the money trail, but they also drove home the critical need to preemptively deny terrorists the funds they need to conduct their attacks. Early financial leads in the September 11 investigation established direct links between the hijackers of the four flights and identified co-conspirators, leading investigators to logistical and financial support cells in Germany and elsewhere in Europe as well as in the Gulf. Financial leads led investigators to key al-Qa'ida operatives and moneymen such as Ramzi Bin al-Shibh in Germany and Mustafa Ahmed al-Hasnawi in the United Arab Emirates. Financial analysis provided some of the earliest evidence proving the synchronized suicide hijackings were an al-Qa'ida operation, and linked the German cell, the hijackers, and Zakarias Mussawi. Wire transfers between Mussawi and Bin al-Shibh played a crucial role leading to Mussawi's indictment for his role in the attacks. Effective though it may be, stemming the flow of terrorist financing will not stamp out terrorism. In fact, unlike Polio or Small Pox, terrorism cannot be eradicated. There will always be grievances, causes, conditions that, coupled with a healthy dose of evil, will lead people to target civilian noncombatants for political purposes or even as a means in itself. The primary responsibility of all states, however, is to protect their citizenry, and to that end it is incumbent upon all states to employ the full range of protective, deterrent, and preventive counter-terrorism measures available in an effort to provide for the security of its populace. The fact that terrorism cannot be eliminated does not absolve states of the responsibility to fight it as much as possible. In this regard, tackling terrorist financing represents a critical and effective tool both in reacting to terrorist attacks and engaging in preemptive disruption efforts to prevent future attacks. Often, as was the case in the investigation of the September 11 attacks, financial transactions provide the first and most concrete leads for investigators seeking to flush out the full scope of a terrorist attack, including the identities of the perpetrators, their logistical and financial support networks, and al-Qa'ida links to other terrorists, groups and accomplices. Since September, the US government has spearheaded a groundbreaking and comprehensive disruption operation to stem the flow of funds to and among terrorist groups. 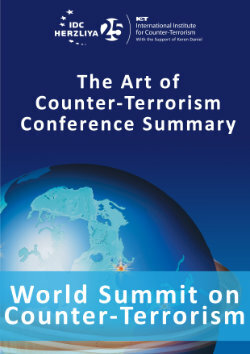 Combined with the unprecedented law enforcement and intelligence effort to apprehend terrorist operatives worldwide, which constricts the space in which terrorists can operate, cracking down on terrorist financing denies terrorists the means to travel, communicate, procure equipment, and conduct attacks. Contrary to conventional wisdom--which pigeon-holes al-Qa'ida in one box and Hizballah, Hamas, Iran and Syria in boxes of their own-militant Islamic groups from al-Qa'ida to Hamas interact and support one another in a matrix of international logistical, financial and sometimes operational terrorist activity. State sponsors of terrorism, particularly Iran and Syria, are similarly woven into the fabric of militant Islamist terrorism. For example, many of the patrons of al-Qa'ida fund the suicide bombings and Qassam rockets of Hamas as well. International terrorist groups do not operate in solitude. A task force on terrorist financing, sponsored by the Council on Foreign Relations, recently highlighted this interaction, noting: "Other Islamic terrorist organizations, Hamas and Hizballah specifically, often use the very same methods-and even the same institutions-[as al-Qa'ida] to raise and move their money. And more recently, published reports suggest that al-Qa'ida has formed additional tactical, ad-hoc alliances with these terrorist organizations to cooperate on money laundering and other unlawful activities. "(5) In fact, while there is no shortage of examples of operational and logistical links between disparate militant Islamist groups, these interactions are most pervasive in the realm of financing. Terrorism in the Middle East is financed by an array of states, groups, fronts, individuals, businesses, banks, criminal enterprises and nominally humanitarian organizations. Terrorist Groups. Realistically, terrorist groups tend not to open bank accounts under their organization's name, especially in the West. Nonetheless, there are in fact cases, such as Hizballah in Lebanon, where groups operate openly and have accounts in their own or other known names. Other groups may boast of their links to such groups. The Islamic Action Front (IAF) in Jordan and the Muslim Brotherhood in Egypt openly state their support for Hamas, and the IAF called for Arabs and Muslims to donate funds to finance Hamas suicide operations. (6) As such, they could be subject to US financial penalties themselves despite the fact that they are not listed in any of the terrorist lists published by the United States or others. Individuals. A few wealthy individuals are able to sponsor much terror. For example, Mustafa Ahmad al-Hasnawi, a Saudi national and Bin Ladin moneyman, sent the September 11 hijackers operational funds and received at least $15,000 in unspent funds before leaving the UAE for Pakistan on September 11. US officials say that Yasin al-Qadi, a Prominent Jidda businessman and head of the Muwafaq Foundation, has supported a variety of terrorist groups from al-Qa'ida to Hamas. According to US court documents, in 1992 al-Qadi provided $27,000 to US-based Hamas leader Muhammad Salah and lent $820,000 to a Hamas front organization in Chicago, the Quranic Literacy Institute (QLI). Based on their connection to Hamas, the US government has frozen the assets of both Salah and QLI. Similarly, US officials maintain that the Muwafaq Foundation is a front organization through which wealthy Saudis send millions of dollars to al-Qa'ida. Humanitarian organizations present an especially sensitive challenge, as authorities must discern between legitimate charity organizations, those unknowingly hijacked by terrorists who divert funds, and others deliberately engaged in supporting terrorist groups. Leaders of the latter organizations raise funds both from individuals purposely seeking to fund terrorist groups as well as from innocent contributors unwitting of the groups' links to terrorists. The assets of Ghalib Himmat have also been frozen for links to Terrorism. Himmat, reported in a German intelligence report to have Expressed "pleasure" over the news of the September 11 attacks, is a Board member of the Geneva section of the Kuwait-based International Islamic Charitable Organization (IICO). (44) The IICO's Palestine Charity Committee (PCC), headed by Nadir al-Nuri, sends its funds through local committees, many of which are linked to Hamas. (45) Himmat is also an executive of the al-Taqwa banking network. Several humanitarian organizations, such as the Mercy International Relief Organization (Mercy), played central roles in the 1998 US embassy bombings in Africa. At the New York trial of four men convicted of involvement in the embassy attacks, a former al-Qa'ida member named several charities as fronts for the terrorist group, including Mercy. Documents presented at the trial demonstrated that Mercy smuggled weapons from Somalia into Kenya, and Abdullah Muhammad, one of the Nairobi bombers, delivered eight boxes of convicted al-Qa'ida operative Wadi al-Haji's belongings—including false documents and passports--to Mercy's Kenya office. Along with Mercy, the Kenyan government also banned the International Islamic Relief Organization (IIRO) after the embassy bombings. (50) From 1986 to 1994, Bin Ladin's brother-in-law, Muhammad Jamal Khalifa, headed the IIRO's Philippine office, through which he channeled funds to terrorist groups affiliated with al-Qa'ida, including Abu Sayyaf. Last October, NATO forces raided the Saudi High Commission for Aid To Bosnia, founded by Prince Selman bin Abd al-Aziz and supported by King Fahd. Among the items found at the Saudi charity were before-and-after photographs of the World Trade Center, US embassies in Kenya and Tanzania, and the USS. Cole; maps of government buildings in Washington; materials for forging US State Department badges; files on the use of crop duster aircraft; and anti-Semitic and anti-American material geared toward children. Currently, an employee of the Saudi High Commission for Aid to Bosnia and another cell member who was in telephone contact with Usama Bin Ladin aide and al-Qa'ida operational commander Abu Zubayda, as well as four other Algerians are incarcerated at Guantanamo Bay's Camp X-Ray for plotting an attack on the US embassy in Sarajevo. Authorities are now trying to track down $41 million, which are missing from the commission's operating funds. In December, US authorities raided the Chicago offices of another Saudi-based charity, the Benevolence International Foundation. The foundation's videos and literature glorify martyrdom, and, according to the charity's newsletter, seven of its officers were killed in battle last year in Chechnya and Bosnia. Contrary to his statements and those of the foundation, documents and cooperating witnesses have indicated that Arnaout facilitated money and weapons transfers for bin Ladin through the foundation and had a personal relationship with both bin Ladin "and many of [bin Ladin's] key associates dating back more than a decade. "(68) In fact, bin Ladin trusted Arnaout enough to allow him to host one of Bin Ladin's wives at Arnaout's apartment in Pakistan where Bin Ladin later picked her up. The foundation was established by a wealthy Saudi and Bin Ladin associate, Shaykh Adil Abdul Galil Betargy, who later transferred control to Arnaout. (69) According to the government's affidavit, senior al-Qa'ida operative Mamduh Salim (Abu Hajir) traveled to Bosnia on documents signed by Arnaout listing Salim as a director of the foundation. (70) Muhammad Bayazid, a bin Ladin operative involved in efforts to obtain nuclear and chemical weapons for al-Qa'ida, listed the foundation's address as his residence in his application for a driver's license. Since September 11, 2001, the Bush administration has issued a Series of financial blocking orders targeting terrorist groups, including terrorist organizations, front companies, and individuals. In total, the US government has designated some 191 individuals, organizations, and financial supporters of terrorism from around the world, including over $34 million in terrorist assets. Other nations have followed the US lead. The Secretary of the Treasury reported that 150 "countries and jurisdictions" have blocking orders in force, and have blocked more than $70 million in assets. (71) According to US officials, intelligence information indicates that terrorist operatives are finding it increasingly difficult to gain access to funds needed to escape the international dragnet targeting them, communicate effectively between cells in different parts of the world, and conduct further operations. Nor are divisions over terrorist financing exclusive to the Middle East. US officials complain that European allies have contributed Few names to the list of alleged terrorist financiers subject to Financial blocking orders, that they have yet to act on all the names already on the list, and that those names European allies have added to the list are primarily domestic groups such as Basque and Irish groups. Europeans, in return, have repeatedly expressed their frustration with US requests to add people or groups to terrorist lists while supplying insufficient evidence, if any. On May 3, 2002, the European Union (EU) added eleven organizations and seven individuals to its financial-blocking list of "persons, groups, and entities involved in terrorist acts." Unfortunately, while the list marks the first time the EU has frozen the assets of non-European terrorist groups, it adopts the fallacy of drawing a distinction between the nonviolent activities of terrorist groups and the terror attacks that they carry out. By distinguishing between the terrorist and welfare "wings" of Hamas, for example, the EU lent legitimacy to the activities of charitable organizations that fund and facilitate terrorist groups' activities and operations. Even within the US intelligence and law enforcement community, The financial war on terrorism has been hamstrung by bitter turf wars between the Departments of Treasury and Justice. The Departments have reportedly launched parallel task forces that do not communicate or share Information. While disconcerting, operational inefficiency and territorialism between agencies pales in comparison to the more strategic gap in policymaking circles. Cracking down on terrorist financing, especially in the case of charitable and humanitarian organizations that camouflage their funding of terrorism by funding legitimate groups and causes as well, requires a political will that was markedly absent until September 11. Terrorist financing through charitable organizations is not unique to Islamic charities, per se, but the fact is that the majority of terrorist groups operating in the world today and targeting the United States are of the radical Islamic variety, and it therefore stands to reason that the majority of charitable organizations engaged in terrorist financing are Islamic organizations. While these investigations should be conducted in a careful and judicious fashion, sensitive to the fact that some organizations are front organizations for terrorist groups and rogue individuals unwittingly hijack others, they should not be confused with "Muslim bashing."